cc licensed ( BY NC ND ) flickr photo shared by Michael B. This last photo looks a lot like the one from 1909. Yes, there are some changes; students are sitting in groups, but really it’s the same. Students still sit in seats at desks, whether they are single or in groups. We have progressed from blackboards to whiteboards to interactive boards. Most classrooms have computers, but sadly that’s all that has physically changed. Our methods and theories have most certainly changed. No longer do students sitting and listening all day (or at least they shouldn’t be). We allow students to move throughout the day. We expect collaboration, creativity, critical thinking, and communication. 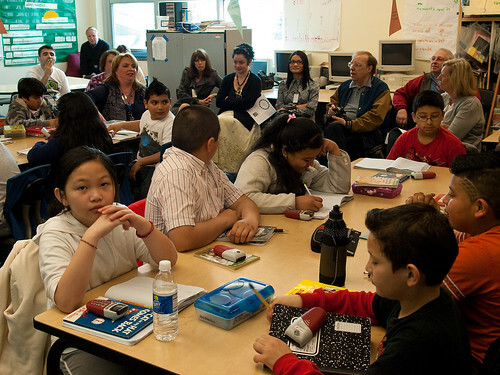 So my question is; why are we still setting up our classrooms based on 19th Century models? I know what you’re thinking…”I don’t do that”. Um, yes you do — and so do I. Yes, you may have ‘centers’, sitting areas, a cozy reading corner, but it’s still basically the same as it’s always been. All that is about to change! Think about the happiest places to work. For me, Google comes to mind. What makes them different? They are comfortable, fun places to be. Shouldn’t schools be that way too? I think so and so does Alice. Check out this classroom! I would love coming to school if I were a kid in that classroom! 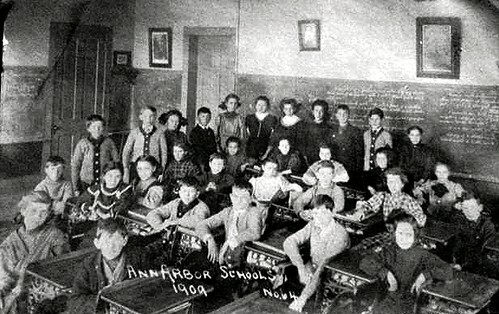 So while we are educating students for the future, let’s give them a classroom that reflects that, not one from 1909. This entry was posted in Classroom and tagged classroom, classroom arrangement by Admin. Bookmark the permalink.